No. 93 Brook Street in 2002. 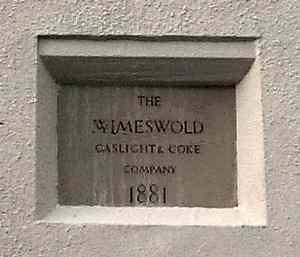 The building which is now 93 Brook Street has a date stone showing 1881. 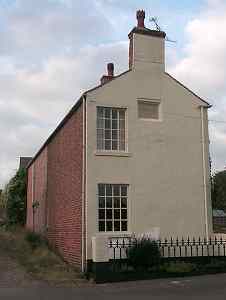 This was part of the village gas works which had been built in 1859 at the cost of �000. This sum was raised by �shares. We know that a James Monk was the foreman or 'working manager' there, and he shared this role with that of resident policeman. From surviving photographs it appears that gas lighting was installed in the streets. The date stone on no.93 Brook Street. The gas works was operational for only a short period as was defunct by the mid-1880s. A trade directory states that the activities were "unremunerative". Others recall that the undergroudn pipes used to distrubute the gas were made of asbestos and began to rot. In a surviving letter a Mrs Hawes, who was born in 1878, says that production stopped because the smell caused a nuisance. Soon after the closure the coking ovens were pulled down and a house built on the site.